So sad but my lovely valentine is missing in action this year. My dear husband is away this day and although neither one of us is very devoted to this holiday it is always nice to be with the one you love on a day everyone celebrates love. I also like the excuse to bake, cook and indulge in special treats and my boys do love any reason to celebrate. Every friday begins with a happy dance and any accomplishment however big or small warrants balloons or cake. This past weekend I got my fill of decadent treats. 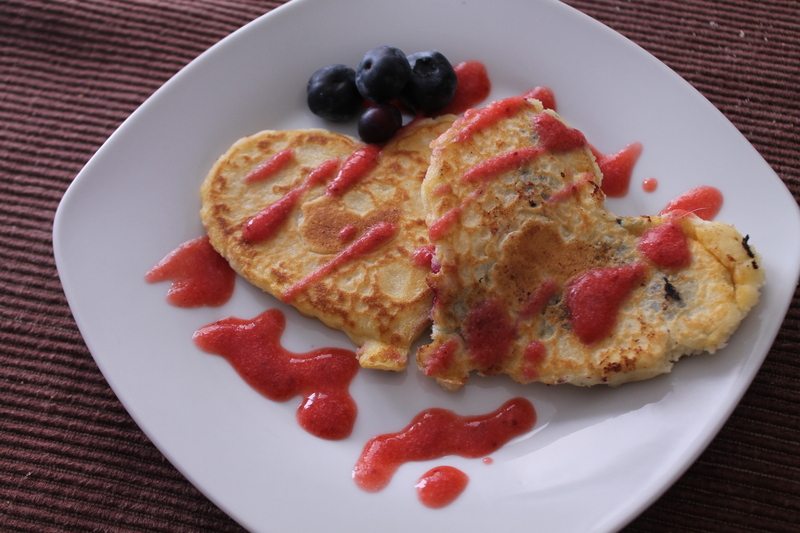 First I treated everyone to heart-shaped Blueberry Pancakes with strawberry sauce. I woke up early Saturday morning which in itself is a sacrifice because I haven’t slept past 8 since I birthed my beloved little monsters. I had to ignore the images of either one of them looking any less than extremely grateful. They needed to jump with glee at the mere sight of my heart-shaped yummies! Lucky for them they all jumped, smiled and sang my praises all morning. These are fairly simple. All you need is your best pancake recipe or box mix, a pint of blueberries and a heart-shaped cookie cutter. I have found pancake molds sold for this purpose however I don’t own one so instead I lightly buttered a heart-shaped cookie cutter and placed it directly in the center of my frying pan then poured the batter right in and dropped a few blueberries. The tricky part was flipping. I had to be sure it was cooked well before removing the mold and flipping. I had a few pancake casualties but it turned out well. The strawberry sauce is a must. I make jars of this stuff and use it in everything. Cakes, cheesecakes, ice cream, pancakes, waffles, crepes, champagne, salads, etc.. Yes, everything! It’s delicious, keeps well and very easy to make. The pancakes were a hit. I also threw in a side of bacon which always makes my men happy. Next up was dessert to accompany dinner. 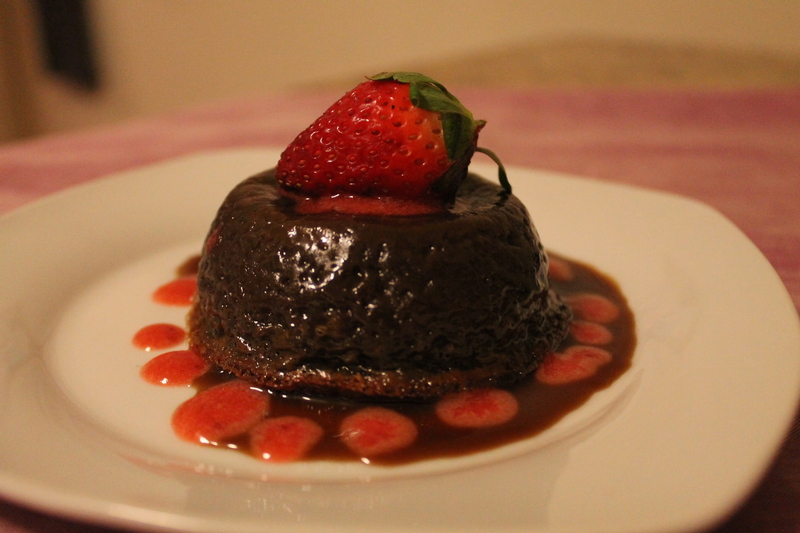 I couldn’t decide between a chocolate lava cake (recipe courtesy of Miss Paula Deen) with strawberry sauce (of course) or vanilla cheesecake (Kraft easy 3 step recipe) with… yes strawberry sauce. So, I made both. The cheesecake turned out to be harder than I thought it would be. I do not own a mini heart-shaped spring form pan so I thought “Oh, I’ll just use the cookie cutter”. After all it worked pretty well on the pancakes and I wasn’t going to stop the heart-shaped theme I had going. The cookie cutter plan was a challenge because I only have 3 heart molds and it doesn’t keep its shape as well. I made my own graham cracker crust which which helped but I had to do a bit of trimming at the end. Next time I will definitely spring for the spring form. The lava cake was hands down the star of the evening. A rich treat of warm chocolate that can never be passed up and of course add a bit of strawberry sauce and it becomes the 8th sin. As my mother would say, “Pleasure on the lips and regret on the hips” but I could say the same thing about pregnancy. So let’s have our yummy cake and enjoy it while it last. Yes that could be another analogy to childhood or motherhood. Some day my boys won’t wake me every morning (however dreadfully early) with kisses and hugs. Soon they’ll think I’m a nag and their pancake appreciation will be less than sincere but for today I’ll enjoy it while it lasts and indulge in these homemade treats with my valentine’s.